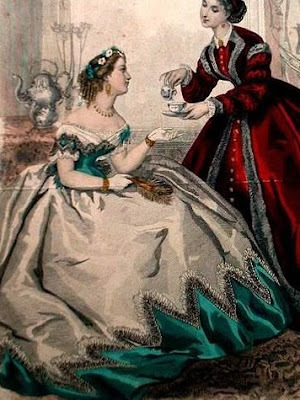 Here is the inspiration for the 1860s Green Silk Ballgown that I am currently working on. I liked the sleeve style and skirt trim. My dress will be mainly Green Silk with white silk trim. It won't look exactly like this picture...this was just the inspiration, then I designed the dress myself based on research from originals and what I thought would look pretty and correct to the period. Check out my GlamorousVintage Etsy shop for my most recent finds! And, check out this great Blog about College Students reproducing an original early 1900s dress. Very interesting! I liked reading about how they used chalk to rub off a pattern from the original dress skirt.